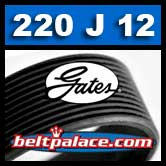 220J12 GATES Micro-V Belt (Bando Poly-V Rib Ace). 22" Length, 12 Ribs (1-1/8" Wide). 220J12 BANDO Poly-V Belt. Metric 12-PJ508 Motor Belt. BANDO INDUSTRIAL 220J12 Belt (12-PJ508). 220J-12 Poly-V Belt. 22� Length. 12 Rib PJ559/220J Section Motor Belt replaces fitness belts, compressor belts, drive belts, and electric motor belts. 220J-12 Micro-V Belt.